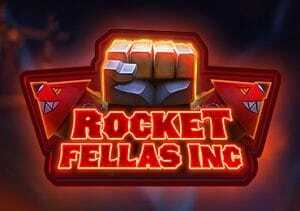 Join a band of miners digging for buried gemstones in Rocket Fellas Inc. Created by Swedish developer Thunderkick, it’s a typically well designed 5 reel, 30 payline video slot. Highlights of the gameplay include rockets that can transform symbols into wilds and a free spins round with sticky wilds. Play on you PC, tablet or mobile from between 10p and £100 per spin. As usual for a Thunderkick game, the visuals in Rocket Fellas Inc are terrifically well done. On the mineshaft reels you’ll find blue, green, orange and red jewels as well as a quartet of burly, bearded miners. The most lucrative symbol is the barrel. Land 3, 4 or 5 of these and you’ll dig up an award equal to 1.5, 5 or 30 times your total bet. The standard wild substitutes for everything bar the scatter and offers the same payouts as the top paying standard symbol. Wilds are central to most of the best action on offer in Rocket Fellas Inc. The rocket symbol can appear on reel 1 in the Rocket feature. When it does, it turns into a wild. Any barrel symbols that are on the same row as the rocket also turn wild. If there are any barrels elsewhere on that reel, they too get the rocket treatment and turn wild. Land 3, 4 or 5 of the iron fist bonus scatter symbol and you’ll trigger the Bonus Game feature and with it, 10, 15 or 20 free spins. If a barrel hits on the same row as a rocket during the feature, it becomes a sticky wild and will lock in position for any free spins you have left. If a barrel then lands on the same reel as a sticky wild, it too becomes wild for that free spin even if you don’t see a rocket. You can add to your allocation of free spins too. Hit 2 bonus symbols to add another 3 freebies to your total. A full re-trigger is awarded if you land 3, 4 or 5 of them – there’s 40 to play with altogether. Rocket Fellas Inc looks as good as you’d expect. There’s a glossy look to the 3D visuals. Some of Thunderkick’s backing tracks have had real earworm qualities. That’s not really the case here though. The gameplay here is pretty straightforward with the rocket and wilds central to the action. It might feel a little vanilla compared to some Thunderkick video slots but Rocket Fellas Inc is still a very playable title as you can win a whopping 7,325 times your bet on every spin. It’s certainly worth a look if you’ve enjoyed other games from the Scandi developer. If you enjoy digging for gold, Diamond Mine from Blueprint Gaming and Dwarfs Gone Wild by Quickspin.